A couple of weeks ago, Apple released one of the most anticipated smartphones of 2016 – iPhone 7. In case you are not familiar with this brand of smartphones, there is a great chance that you will be confused about this brand new iPhone 7 because, at first glance, this model doesn’t look much different than the iPhone 6. However, even though the external appearance might not be drastically different, they are quite different under the hood. This difference is especially big when we compare it to iPhone 6s model. Now let’s see what these differences are because this is the only way to decide whether it is worth getting the latest iPhone 7. As we already said, when it comes to design, iPhone 7 is similar to iPhone 6s. However, this new model comes with antenna strips that are placed on the top of the back of this device. 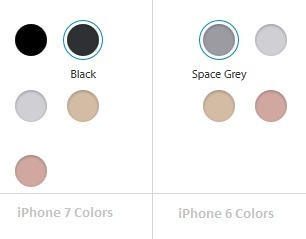 They were placed lower on the iPhone 6s. Instead of a headphone jack, the iPhone 7 comes with a Lighting port and high-quality stereo speakers. It is interesting that iPhone 7 has exactly same dimensions as iPhone 6s but it is about 5 grams lighter (138 grams). Finally, iPhone 7 has redesigned home button and comes in three colors while iPhone 6s was available in four colors (Space Grey was excluded). It’s also good to point out that Apple iPhone 7 has a superior hardware. According to some experts, the A10 Fusion is about 40% faster compared to the A9 found in iPhone 6s. The battery life is also improved (2-3 hours more). Just as expected, the cameras on iPhone 7 have improved too. The main camera has 12 MP while the front camera has 7 MP. What’s even better is that the rear camera will capture videos and images with 4K resolution. Will you iPhone 7 need a screen repair? There are many people who are interested in the look and properties of the screen found in this model. Truth is that many people in the past needed iPhone Screen repairs and they want to know whether the new screen is better. iPhone water damage -a thing of the past! Before we start talking about the protection and durability, let’s mention that the most important change that we can see to the screen of this newest model is the color and brightness. The officials from Apple have revealed that the new screen comes with 25% more brightness compared to iPhone 6s and more colors. However, the screen still has the same dimensions, which is quite natural because most people agree that the size of the screen is optimal. Needless to say, the resolution display is still the same (1334×750). The situation is a little bit different when it comes to the durability and strength of the screen. First of all, the iPhone 7 is waterproof and the manufacturer guarantees that the phone is following certain standards related to waterproofness. But, what about shatter and drop performance? Obviously, Apple doesn’t provide any information about these things except they recommendation to use their phones carefully. However, several drop tests have shown that the screen of iPhone 7 is more durable than the screen of iPhone 6s. There were cases when the iPhone 7 was dropped face down from ten feet and the screen remained in good shape. The iPhone 6s’ screen didn’t survive this drop. Just like iPhone 6s, iPhone 7 is quite flexible. This means that users can bend the phone, at least to some extent. The initial tests have shown that the screen can bend more than iPhone 6s and survive bending at greater angles. There are some users who have conducted burn tests and again, iPhone 7 has shown great resistance and ability to recover from high heat exposure. There was even a scratch test and the users were satisfied. There is one thing that many of these tests are not taking into consideration. Besides the fact that iPhone 7 just like iPhone 6s comes with 3D touch feature, the fact that this latest model of iPhone has more features and better camera and longer battery life will make many users increase the time spent on their mobile device. This means that it is more likely that the new screen found in this model will need to be repaired. iPhone 7 screen repair might be more frequent. We still don’t have official information about the number of repairs because the iPhone 7 has just been released in the market, but many iPhone repairs Brisbane companies have confirmed that the first users of this new model have asked them for help. Yes! iPhone 7 is definitely worth the upgrade, at Screen Fixed we believe its Apples best work yet.